The air inlet control servo motor sends pulse signals to indicate the damper position to the A/C amplifier. The A/C amplifier activates the motor (normal or reverse) based on these signals to move the air inlet mode selection air inlet control damper to any position, which controls the intake air settings (FRESH, FRESH/RECIRCULATION, and RECIRCULATION). (d) Operate the R/F (Recirculation/Fresh) switch. 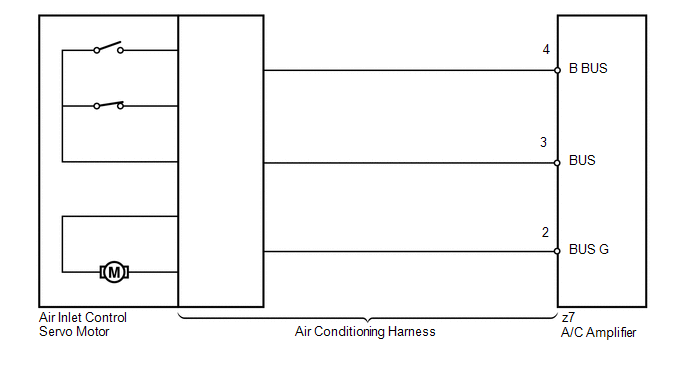 Recirculation damper position changes in accordance with each control range. (a) Replace the air inlet control servo motor (See page ).